It’s not all fun and games in the shop. Wait! Actually, it is! It is always fun and games in the shop. Even when we aren’t making crazy bottle openers, or amazing coat racks. Any day cutting and welding stuff in the shop is a good day! Today’s challenge was to create custom supports designed to support the roof over a covered porch. Normally people use something like a wooden post. But there’s one really bad problem with those, they rot! Which is exactly what happened to the wood supports our new steel ones will be replacing! The idea was to fabricate new posts with plates on each end so they can be bolted into the concrete at the bottom, and screwed into wood at the top. So, we used the CNC machine to cut out mounting plates, which we welded on the end of 3″ x 3″ tubular steel that was cut to exactly 103″! Small jobs like this sound so simple, which is actually deceptive if you want the job done right. There are so many little details that make all the difference. 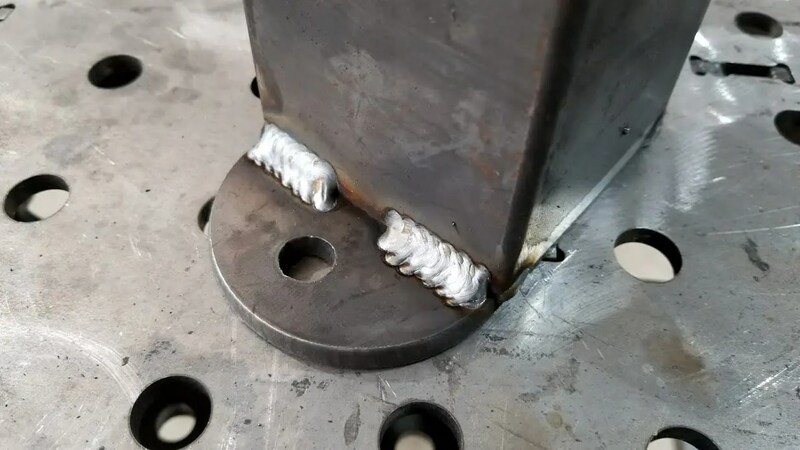 For example, in addition to ensuring that each of the four supports is exactly (within 1/32 of an inch) the same height, you have to make sure that the metal cutting bandsaw is set to cut at exactly 90-degree angles to ensure the supports stand up straight. 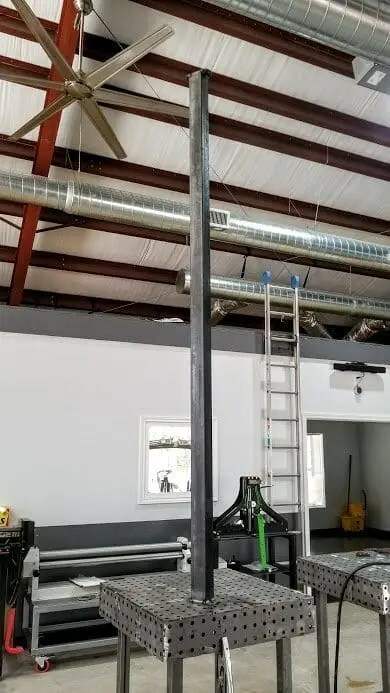 We always triple check the angles of our cuts, which is why we’re able to get each of these 10-foot tall supports to stand on end with no supports. Because of the critical nature of these supports, it was important to make sure all of the welds are strong, the steel is top quality, and they’re professionally primed and painted to ensure a long outdoor life even with Houston’s harsh weather. By sweating the details to ensure perfection, we make it easier for the client when it comes time to install the critical posts that hold up a roof. And more importantly, we’ll deliver a product you’d feel safe to live under for decades to come. It’s not a job when you love what you do! Next post: Making the World’s Best Grill Grate!